The Wind Gods: The story of the 33rd America's Cup Film Premier: "ORACLE TEAM USA skipper Jimmy Spithill, team owner Larry Ellison and film producer David Ellison at the America's Cup Park on Pier 27, ahead of a special screening of 'The Wind Gods', a documentary about Ellison's historic win in the 33rd America's Cup." Adaptive Sailing on Lake Michigan offered for people with disabilities through Judd Goldman program | abc7chicago.com: "There's nothing like sailing on Lake Michigan. It is an activity that anyone can learn, regardless of their limitations, and there is a program that helps make it possible. Twenty-four years ago, Judd Goldman Adaptive Sailing Program started with three sail boats. Now, they have 20 boats ready for people with disabilities to conquer the winds. Burham Harbor is where the program is located. It is open Wednesdays through Sundays during boating season. "We will train them from novices completely never being on a boat before, all the way up to we actually have our first instructor who just graduated from the program," said Joseph Harris, the director of sailing. All fleets are adapted for different disabilities. . . . ."
The breeze switched on in a big way today at the 11th annual C. Thomas Clagett, Jr. Memorial Clinic and Regatta, where 36 sailors with disabilities, sailing 23 boats in three Paralympic classes on Narragansett Bay, showed what they were made of. Sailing by the Sun: "The world’s largest solar-powered ship stopped in New York City on June 20, 2013." After a day of fresh to strong winds off the Old Head of Kinsale, slightly easier conditions should allow the full fleet of 90 boats to sail their final races in the Covestone Asset Management Sovereigns Cup today. Why not take a sailing trip this July? BENETEAU 31.7 ECHO - 1. Avalon (R.Conan/J.Fox), 2. Kernach (Eoin O'Driscoll), 3. Levante (M.Leahy/J.Power). BENETEAU 31.7 - 1. Prospect (Chris Johnston), 2. Levante (M.Leahy/J.Power), 3. Kernach (Eoin O'Driscoll). CRUISERS 0 ECHO - 1. Sharpie National Championships return to Sydney in 2014. 29 Jun 2013. The New South Wales Sharpie Association has announced that the Georges River Sailing Club on Botany Bay, Sydney will be the host of the 2014/15 Sharpie National Championships. Authorities search for a crew of seven, including six Americans, that disappeared three weeks ago. Inside the America's Cup: No Second Place - Ep 1 - YouTube: NO SECOND PLACE, a Red Bull Media House six-episode production in conjunction with the America's Cup, offers a fascinating and dramatic perspective at the world of sailing with a behind-the-scenes look at the teams competing at the 34th America's Cup, September 7-21, 2013 in San Francisco. This documentary-style production goes inside the teams, boat designs, training regimens, rules, the speed of the sport, strategy and teamwork, among other elements. In this first episode titled Racing to Win, we set the scene by showcasing the stunning power of the new AC72's and the drama that envelopes day-to-day life as the America's Cup speeds its way towards September. ORACLE TEAM USA wants to defend its title, but New Zealand, Italy and Sweden are all gunning for the trophy too.These elite sailors are constantly pushing the limits of both themselves and the AC72 and this opening show delivers perspective from team members as they break down what it will take to raise the Cup. This is the pinnacle of racing and the oldest active trophy in International sports. There are national bragging rights at stake and there is "No Second Place." WELLINGTON/SAN FRANCISCO (Reuters) - Team New Zealand and Italy's Luna Rossa Challenge plan to appeal late changes to the America's Cup sailing regatta in San Francisco following a fatal training accident by Swedish challenger Artemis in May. A series of special sailing regattas are being held on England's largest lake this summer. The events, run in conjunction with Windermere Marina Village and the Windermere Cruising Association, have been attracting more than 25 sailing boats at a time. Cotswold Sailing Club will hold a free open weekend on Saturday and Sunday (10am-4pm both days). Lake nine at Cotswold Water Park will be open to non-members who want to experience sailing with qualified instructors. Safety gear will be supplied. One of our favorite ways to enjoy the Mexican Caribbean is to take a sailing excursion. Romantic sunsets, snorkel tours, do it all on a sailboat. Why Larry Ellison Is Obsessed With America's Cup: Video - Bloomberg: "Author of "The Billionaire and the Mechanic" Julian Guthrie discusses Oracle CEO Larry Ellison's Americas Cup sailing interests with Pimm Fox on Bloomberg Television's "Taking Stock. (Source: Bloomberg)"
The Shapes of Foiling - AC UNCUT: "AC UNCUT's Genny Tulloch goes behind the scenes at ORACLE TEAM USA's base on Pier 80 in San Francisco to have a chat with Designer Joseph Ozanne about the shapes of foiling." America's Cup boats don't agree on safety changes: "Two weeks before the launch of the first America's Cup race, competitors continue to quarrel about new safety rules put forth in the wake of last month's training fatality. The primary stalemate involves changes to the overall weight and rudder dimensions – so-called "class rules" -- of the turbo-charged multihull AC72s, which when foiling can reach speeds of nearly 50 mph. "It's just frustrating when you're literally thirteen days away from starting the first race and you could be forced to actually make changes to the equipment, which if you are making design-related decisions should have happened a year ago," said Dean Barker, skipper for Emirates Team New Zealand, in an interview with USA Today Sports on Thursday. . . ."
The first episode highlights the power of the new AC72s as the America's Cup speeds its way towards September when ORACLE TEAM USA will hope to defend their title, however New Zealand, Italy and the Swiss team are all gunning for the trophy too. Chris Draper debuted with Luna Rossa Challenge on the America's Cup World Series (ACWS) at Naples on April 11, 2012. Four days later he and his Luna Rossa mates were standing atop the championship podium, winners of their first ACWS regatta. Gruppo Campari has launched a limited-edition Skyy Vodka bottle to mark its sponsorship of Emirates Team New Zealand in the America's Cup. The bottle, available during the racing season, will only be on sale in California, Campari said . . . Sailing through life - LIFE - BEIJING - Globaltimes.cn: "After 137 days and 21,600 nautical miles on the open water, Guo Chuan couldn't wait a moment more to reach the dock as his sailboat approached Qingdao, Shandong Province. Guo, 48, jumped into the sea, swam to the bank and crawled into the arms of his wife and two children. Tears, rain and sea water soaked him through. Guo's arrival at Qingdao, on April 5 marked a new record for a solo nonstop sail around the world with a 40-foot vessel. " America's Cup: Oracle, Emirates New Zealand, and USA 76, June 21 2013 - YouTube: "Published on Jun 22, 2013 Great boat handling with foiling gybes!" America's Cup dispute could end up in court - SFGate: "Sources close to the negotiations told The Chronicle that Team New Zealand and Luna Rossa consider the elevators used by Oracle and Artemis illegal and could take the matter to court depending on a possible verdict by the AC jury. The Oracle/Artemis elevators have ailerons, like the movable flaps on airplane wings. The New Zealand/Luna Rossa ones don't. America's Cup spokesman Tim Jeffery said that all the parties are contractually obligated to accept the jury's ruling. 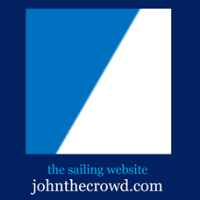 However, the sources said the matter could be brought to the New York State Supreme Court, the guardian of the America's Cup's originating document, known as the "Deed of Gift," on the grounds that the jury has overstepped its jurisdiction." Try Sailing for FREE at Girton SC! Croatia, sailing magnet now, but what after she joins the EU in July? The two day regatta was sailed on Melbourne's Albert Park Lake in light wind conditions under clear skies. It followed its traditional short course format with one or two lap dashes of around 30 to 40 minutes across the three half day sailing sessions. A windless, relaxing day in the harbor is not ideal for Waukegan Yacht Club's Junior SailProgram participants. These kids want high winds and high speeds. Still, there's something to be said for a lazy day of sailing around the Waukegan North Harbor. A teenager born with atheroid cerebral palsy, which affects her limbs as well as her speech, is attempting to sail across the English Channel using just her mouth to control the boat. Natasha will sail solo across the English Channel Credit: Tenpointstick. America's Cup: Preview of June 21 2013: "ETNZ in great foiling gybe!" SAP® Solutions Transform the World’s Largest Sailing Event, 2013 Kieler Woche: " . . . Bringing sailing fans and spectators closer to the action, the official regatta website will feature an online "SAP Live Center," available in German and English, making the regatta action accessible to an international audience. New this year, SAP will deliver the English version of Kieler Woche TV on the regatta website, providing three hours of live daily race footage and expert SAP commentary. For the first time at Kieler Woche, SAP will also hold "Regatta Reviews" on the Audi Main Stage, enabling all sailors to benefit from SAP expert analysis. More information on how to participate in sailor debriefs and Regatta Reviews is available on the regatta website and at the "SAP Sailors Lounge" on site. . . ."
The RC44 heavy weights Team Aqua fleet has returned for the third consecutive year to the sailing mecca of Marstrand, Sweden for round three of the 2013 RC44 Championship Tour,after a tantalizingly close finish to the RC44 Trapani Cup last month.